Elastomeric (rubber) expansion joints have long been recognized for their ability to reduce noise and vibration and accept fluctuating thermal movements in piping systems. Recent advances in engineered elastomers and textiles led to the development of expansion joints with improved performance and operating life that benefit both new and existing construction. Equally valuable is their unique ability to be built to and installed in offset and misaligned applications. These cost saving features have made the expansion joint a pivotal component in replacement and retrofit projects as well as in new construction. In past years, the most common expansion joint fabric reinforcement was a square woven cotton or polyester. Square woven implies that the fabric strands are intertwined perpendicular to each other and have approximately the same strength in each direction. If greater strength is needed in one direction, the engineer was forced to increase the overall number of plies, thereby increasing the strength in both directions and consequently, the overall stiffness. Stiffness is loosely defined as the force needed to move the joint a fixed distance. A relatively small arch was used making the product extremely stiff with minor all directional movement capability. 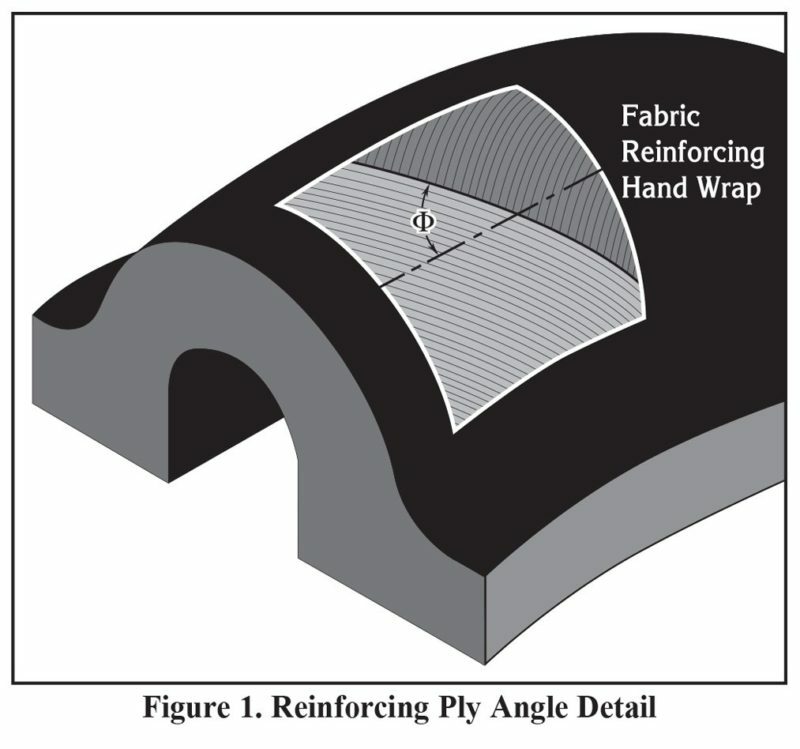 Utilizing modern engineering principles and materials developed largely in the tire industry, today’s expansion joints use tire cord reinforcement plied up on a specified bias angle (see Figure 1). The bias angle can be changed to increase the strength in one direction versus the other. This is significant because the resultant forces in an expansion joint are typically greater in the axial and not the radial direction. Bias angle adjustment is even more necessary when a large arch is used for increased movement. Tire cord also ensures a superior rubber to fabric bond because it is coated with an advanced adhesive called Resorcinol Formaldehyde Latex (RFL). This RFL coating was also developed by the tire industry to optimize the bond strength between elastomer and fabric, preventing ply separation and delamination. Advancements in engineered elastomers have made it possible to design expansion joints for continuous exposure to higher temperatures (400°F), pressures in excess of 350 psi, as well as high resistance to chemical erosion and abrasion. For many of these designs, we use DuPont Viton® or Teflon® liners and Kevlar® tire cord reinforcement. The combination of advanced elastomeric compounds, superior bond strength between plies and an optimal number and angle of plies creates a homogeneous composite with consistent and predictable engineering capabilities. The larger arch form and reduced overall number of plies act to increase all directional movement capabilities while minimizing stiffness (see Figure 2). The greater flexibility of today’s joints minimizes stress on the piping system. When the expansion joint accepts thermal and vibration movement, it replaces these stresses, which can quickly exceed allowable pipe stresses, with the stiffness of the joint. This joint stiffness also varies with system pressure, and to illustrate this effect, simply picture a garden hose. It becomes stiff and wants to straighten out under pressure, and so does the installed expansion joint. 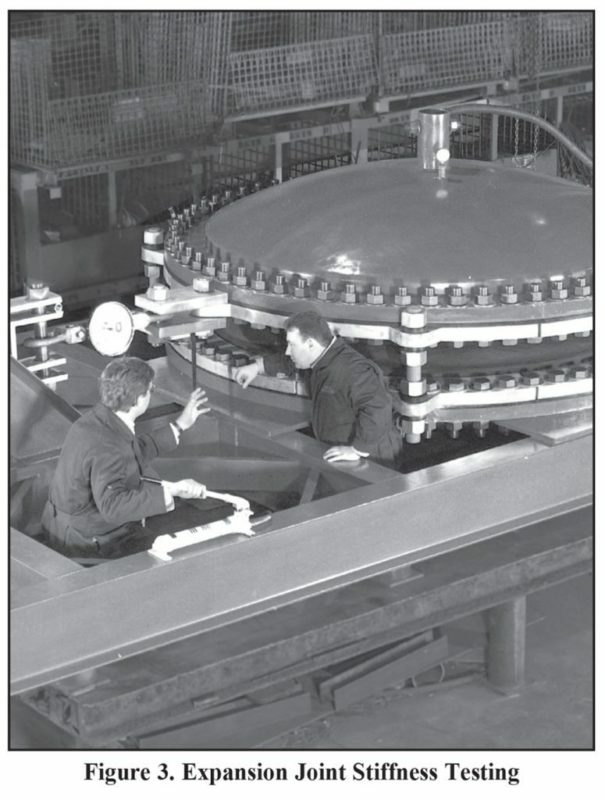 While calculations can approximate the joint’s stiffness and pressure effects, it is preferable to do actual full scale testing (see Figure 3). Obtaining accurate stiffness values at design pressures is important when designing the piping system. Knowing and minimizing the expansion joint stiffness is even more critical in advanced designs such as the pressure balance arrangement (see Figure 4). In this arrangement, as the name implies, the primary function is to balance or cancel out the internal working pressure in order to minimize the net end loads acting on adjacent piping or equipment. Minimizing pressure forces makes the remaining force largely that of the expansion joint stiffness. 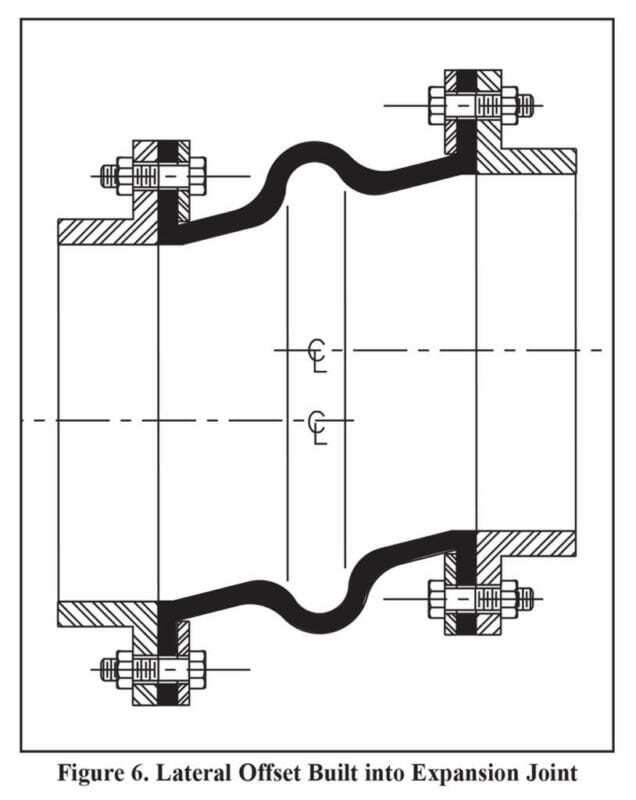 Because there are two expansion joints in a pressure balance arrangement, the stiffness values are roughly double. The pressure balance configuration takes the shape of a “T”, with two expansion joints in line at each end. One end is always capped off and the arrangement functions as a flexible elbow. The net pressure thrust force from each expansion joint cancels each other out, leaving only the stiffness of the expansion joints, along with some minor restoration forces acting on the system. Minimizing the joint’s stiffness is key to optimizing this arrangement. The two expansion joints perform together to accommodate external movements, e.g., thermal, vibration, settlement, etc. For example, if the pipe moves laterally into the “T”, the two expansion joints will deflect laterally. Alternatively, if the pipe moves axially or in line with the two expansion joints, one expansion joint will act in compression while the other acts in extension. In all cases, the additional stiffness of the two joints is considerably less than the pressure thrust force, demonstrating the benefit of the arrangement. Building expansion joints to exact field dimensions addresses another critical problem in both replacement and retrofit projects. In the course of their life span, typically 15-20 years, piping and equipment settle and offset at different rates. 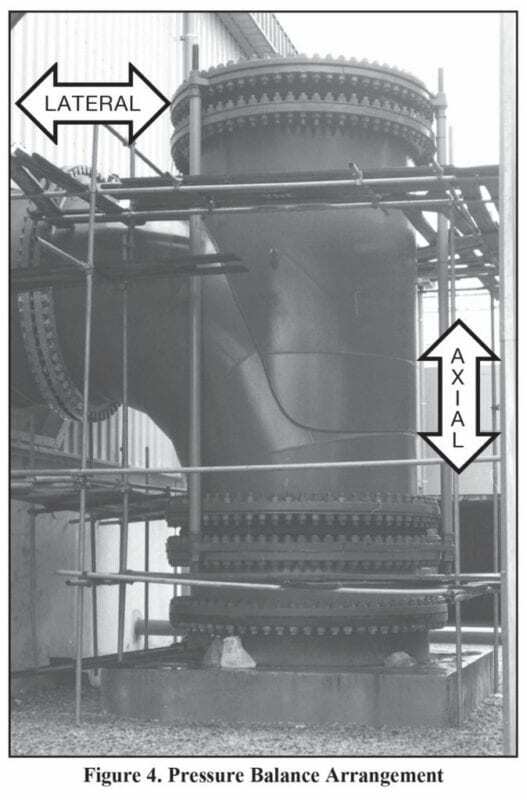 A large diameter condenser, for example, can develop non-parallel flanges and large lateral offsets. 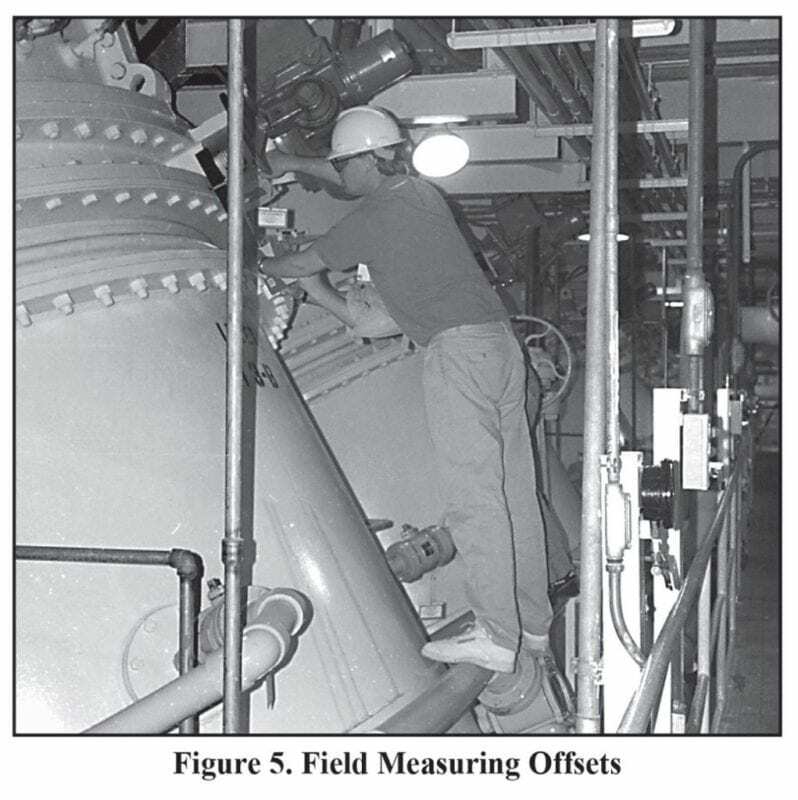 This was the case in a North East Nuclear Power Plant when the 108” diameter pipe had lateral offsets in excess of 2” (see Figure 5). While the condenser and the piping system as a whole had many years of use left, the problem became how to fit this offset when replacing the expansion joint. Typically the adjacent valve is replaced at the same time and when replacing this equipment, it is often cost prohibitive to realign the piping. It is also unrealistic to order a replacement valve with varying overall lengths and built in lateral offsets. However, it is relatively inexpensive for the expansion joint manufacturer to incorporate these field discrepancies into the replacement expansion joint (see Figure 6). Before this technique was developed, the installation crew could spend a great deal of time and effort, forcing a straight standard product into an offset and misaligned location. After an exhausting installation process, the straight joint would have a substantially reduced operating life due to the permanent installation stresses. In some cases, the actual field measured offsets exceed the allowable movement capability of the joint, almost ensuring an imminent failure. When the expansion joints are custom made to fit, it not only minimizes the installation time and expense, but also insures 100% of the allowable movement capability and operating life. Advanced features and engineered safety factors further increase reliability and life expectancy. Retrofit applications are slightly different in that a complete section of equipment and piping is often replaced. The problem arises when the new equipment does not line up with the old piping. Center lines of the pump’s suction and discharge may be different from the original equipment, etc. 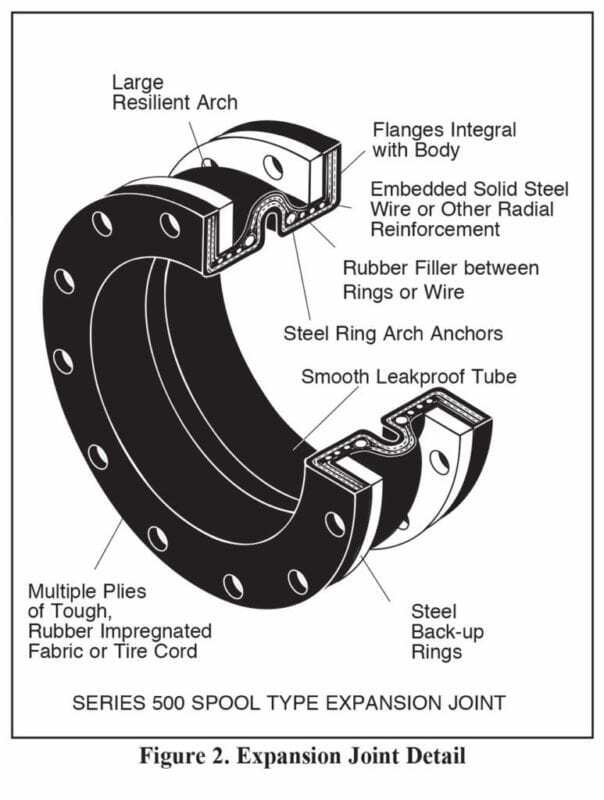 The expansion joint can be used as a transition piece between the new and old flanges. If a 1”, 2”, 3”, etc. lateral offset is required, it can simply be molded into the expansion joint. This gives the design engineers greater flexibility when designing retrofit systems. New design features in piping expansion joints have enabled them to do more with less. Its versatility includes accepting greater all directional thermal movements, greater flexibility for reducing noise and vibration, excellent resistance to shock and fatigue. Incorporating these advantages in special arrangements as well as custom building expansion joints to exact field dimensions or retrofit dimensions offers greater opportunity to the design engineer. Furthermore, advanced engineered elastomers and textiles have made it possible for expansion joints to be used in a wider cross section of chemically abrasive and erosive mediums under higher system temperatures and pressures. 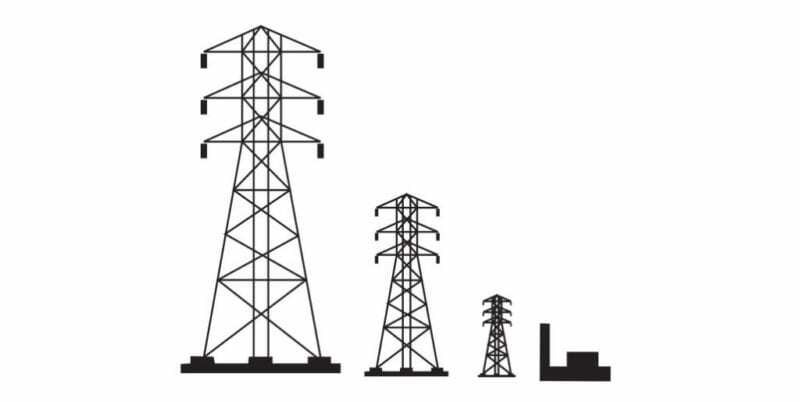 The American Power Conference is an annual national forum of ideas concerning aspects of electric power, including: fuels, generation, transmission and distribution. The primary emphasis is on technology as it effects and enables competition and globalization of the power industry. Sponsorship is by the Illinois Institute of Technology (IIT) with the cooperation of professional societies and other universities. The meeting is concurrent and integrated with the annual meeting of the Energy Division of American Society of Civil Engineers. No affiliation is required. Policy is guided by an advisory board. Presentations at the Conference are by invitation. They are selected from the many abstracts received, following the Call for Papers which is issued in early July, and due by early September. Invited sessions are organized by experts in certain fields where the subject matter is of particular timely interest.